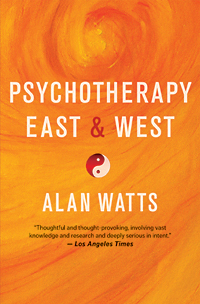 Spiritual philosopher and author Alan Watts introduced millions of Western readers to Zen and other Eastern philosophies, and New World Library is pleased to be reissuing his book Psychotherapy East & West, which was originally published in 1961. Watts proposes that psychotherapy without an understanding of Eastern philosophies can fall short of helping one to reach a feeling of true liberation. In fact, Watts proposes that Western science and art actually reach a closer agreement with the Eastern view of “liberation from suffering” than conventional Western psychotherapy. We hope you’ll enjoy this sampling of excerpts from the book’s preface and three of its chapters, “The Ways of Liberation,” “Through a Glass Darkly,” and “Invitation to Dance.” Together they offer a glimpse into the wonderful and complex mind of the iconic Alan Watts.